The Anthropology Museum was the only museum recognized with the award this year. 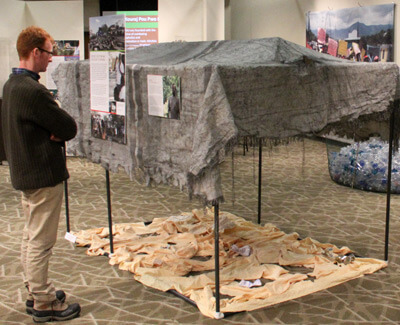 “Fragments: Haiti Four Years After the Earthquake,” which was on display from January through July 1 of this year, invited visitors to explore the lives and living conditions of Haitian people living “under the tents” since the devastating 2010 earthquake. Visitors were able to enter a tent provided for people displaced from their homes by the earthquake and view artifacts of tent life. Reproductions of a dwelling in one of Port-au-Prince’s shantytowns helped recreate the experience of life as a Haitian today. A number of Haitian activists also spoke during the exhibit’s run, so visitors could learn how to help and make a difference. The exhibition was based upon more than 13 years of research by Mark Schuller, an NIU professor of anthropology and NGO Leadership Development and affiliate at the Faculté d’Ethnologie, l’Université d’État d’Haïti. Schuller’s research on NGOs, gender, globalization and disasters in Haiti has been widely published. Jennifer Kirker Priest, director of the Anthropology Museum, said she and her staff were honored by the recognition. 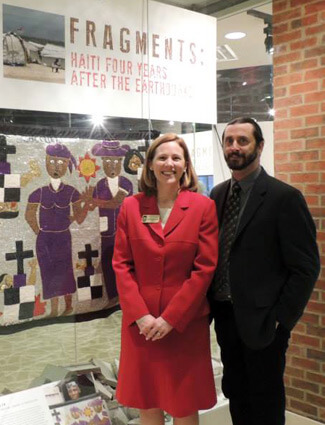 “For our friends in Haiti, this exhibition was something so extraordinary that we are really excited to share this award with them,” Kirker Priest said. The Illinois Association of Museums provides advocacy, promotes best practices and fosters the exchange of ideas for the Illinois museum community. For more information on the NIU Anthropology Museum, call (815) 753-2520 or email anthromuseum@niu.edu.